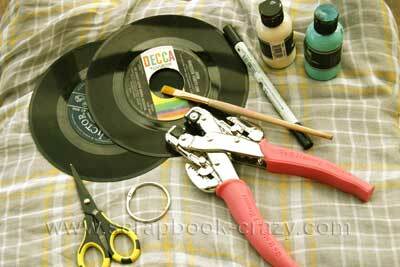 Another great upcycle tutorial, I really love repurposing stuff into fashionable mini scrapbook albums. This time Megan from The Nerd Nest shows us how to make this mini with those old fashioned vintage 45 vinyl records that our mamas and papas used to listen to way back when. 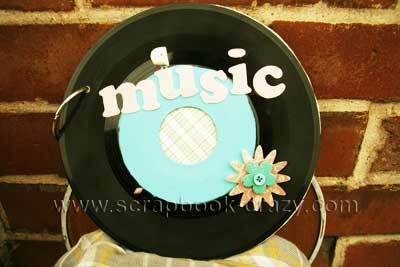 Wouldn't they make just the most perfect scrapbook gift for your music crazy friends and family. Megan also sells these little beauties at her Etsy store too in case you want all the fun of creating your mini keepsake minus the painting and gluing and stuff. materials. I used a crop-a-dile. 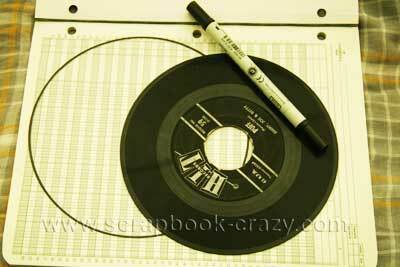 Trace the outline of one of your records onto patterned paper or cardstock with a pen. 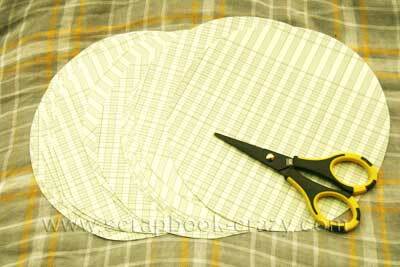 Cut slightly inside the lines the resulting circle out using scissors or a craft knife to insure there is no overhang. 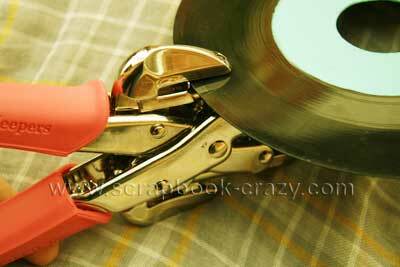 You can also use a circle cutting tool, if available. The resulting circle should be about 6.75 inches in diameter. Repeat step one until you have the desired amount of inner pages for your book. To save time, I layer paper and cut several circles out at once. 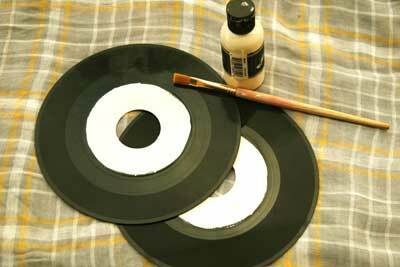 Paint a white base coat over the label stickers on one side of each record. You may need to paint two coats to ensure full coverage. Let this coat dry. Paint a coat on top of the white base coat in the color of your choice. Punch a hole approximately 0.5 inches into your first record cover. When you punch a hole in the second cover, make sure that you are punching the hole in the same spot as on the first cover by lining the records up, inside to inside, and using the first record as a guide. 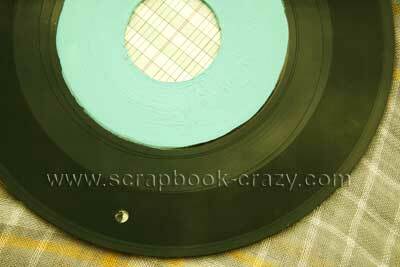 Using the first record as a guide, center the inner pages inside the first record and punch a hole through the inner pages. Bind the covers and the pages together with a binder ring. Decorate the cover of your mini with stickers, rub-ons, or other scrapbooking embellishments! Now you’re ready to decorate the inside! This mini would be prefect for concert photos or tickets, your favorite lyrics, or your current playlist. 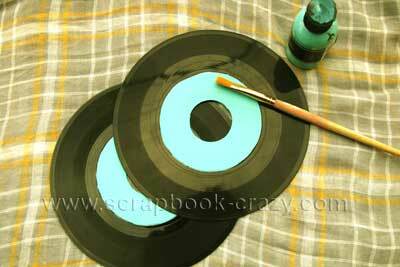 You could cover the label sticker with scrapbooking paper instead of painting the record. I like to leave the inner label unpainted so that I can see the history of the records, but you can cover this as well. Thanks so much Megan for this sweet mini scrapbook. Remember to take a browse through the Nerd Nest store to see some delicious mini albums and unique one of a kind embellishments and support Hand Made Crafts. 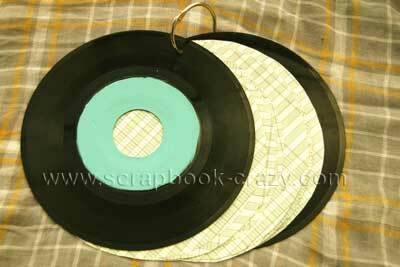 Return from these Record Mini Scrapbook Albums to see more minis.